Fall has arrived and it is the time people clean up their yard, houses, and roof to prepare for winter. It is also the time of year that I see more knee pain! I want to share some tips for knee pain and a patient story that I hear quite frequently. Can you relate to Nancy’s story? “I thought my knee pain was just due to age or arthritis. I didn’t want to bother the doctor about it.” Nancy is 62 years old and she is a retired nurse. She suffered with knee pain for 3 years before seeking help. 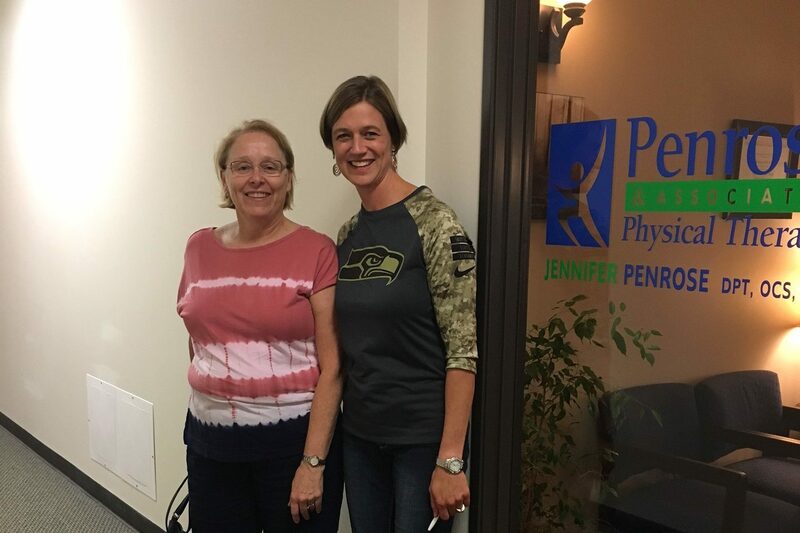 When she could no longer play on the floor with her grand kids she finally decided seeing a physical therapist might be helpful. She was relieved to know that the knee pain was not arthritis and that it was treatable. We were happy to help Nancy in 5 weeks time. She is now able to get up and off the floor easily without pain. Please do not ignore pain! Many times the pain you fear and the cause of it is not what you think it is! 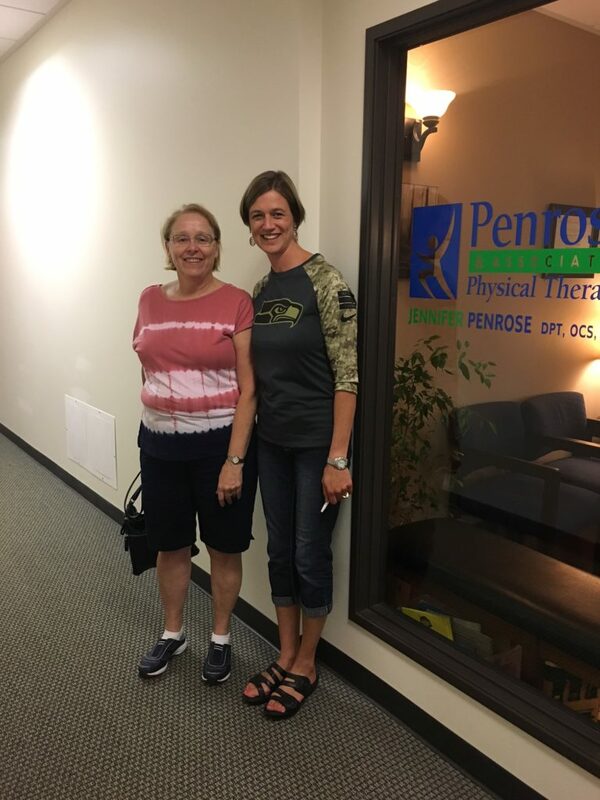 Even if you are in healthcare field like Nancy, you may be surprised at what physical therapy truly does. It helps you get back to your life with improved mobility and less pain. It is not just for after surgery or major trauma. We are here to help you with that annoying pain that seems to stick around and slowly starts to impact your quality of life. My advice is if you have had pain for 2 weeks and it is not improving come see us. There is no need to suffer longer. Life is too short. Nancy can now play on the floor with her grand kids and enjoy traveling and retirement! Thanks Nancy for letting us share your story! Ice and elevate your knee to minimize the swelling for 15 minutes 2 times a day. Elevation is actually more important than icing. Elevation means your knee needs to be above your heart for the swelling to drain out of the knee (the rules of gravity apply here). Having your knee just propped up on a foot rest while sitting is not elevation. Wear shock absorbing shoes at all times. This will help absorb the impact during weight bearing and standing. Participate in gentle range of motion that is not weight bearing such as a stationary bike. This allows the knee to have great lubrication, increase nutrition and blood flow to the joint and surrounding structures. Motion is lotion and helps the ache and stiffness. Many times the first few minutes on the bike are achy but if you work through that you often feel better afterwards. Limit stairs until your swelling goes down. See a physical therapist to help guide you with how much resistance and when and which exercises are helpful or harming you during your recovery. We can also perform orthopedic special tests on the knee and determine if seeing an orthopedic surgeon is warranted. Regardless motion is lotion and the key to maintaining independence and mobility is to partner with a physical therapist from time to time. We are happy to help you with your goals. You can also download our free tips report on knee pain from the Penrose & Associates Physical Therapy website. Please email jennifer@penrosept.com if you have specific questions. We are here to help.